Merna Mora is centrally located for tours to the gorges and areas of interest. Spectacular sunsets and ever changing views of Wilpena and Elder ranges make our location a must for keen photographers and artists. We provide a quiet, relaxing environment, with an abundance of fauna, flora and birdlife and can offer a wealth of local, historic and cultural knowledge. 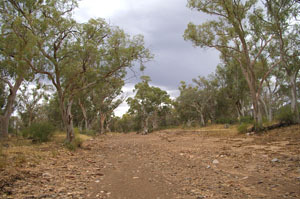 Walking distance from Merna Mora is the Moralana Creek. The Moralana Scenic Drive around the Wilpena Pound through Bunyeroo and Brachina Gorges. This tour covers the historic copper mine, Great Wall of china, Stoke's Hill and Aroona Valley. Kanyaka Historic Pastoral Ruin, Buckaringa and Warren's Gorge, Junction Art Gallery, Pichi Richi Steam Railway (seasonal), via Quorn. Flynn of the Island, Smith of the Dunesk Mission, Beltanna cemetery, Sliding Rock, Puttapa Gap, Aroona Dam, Leigh Creek coalfield, Bush Bakery Copley. 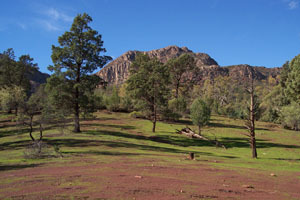 Return via Parachilna Bush Hotel. Flynn of the Island, Smith of the Dunesk Mission, Beltanna cemetery, Bush Bakery Copley, Lyndhurst, (start of Strezleki Track) bush character, Talc Alf, Indigenous ochre pits 4km north of Lyndhurst. Don't hesitate to phone us on 08 8648 4717 or email us if you have any enquiries, we will be happy to help. See what Merna Mora has to offer. Watch our promo video here. View a range of images here. This stunning range of images have been taken by guests staying at Merna Mora. Various unique, picturesque, adventurous and exclusive self drive four wheel drive tracks are available. various sites of historic interest. All of these areas are accessible by conventional vehicle and within an hour’s drive from Merna Mora. Scenic flights can also be arranged.